Annotated tree of the Bloxam and Roby families. There is an excellent review of Bloxam's botanical material on the Meiosis web site. Wikipedia provides useful information about his life. FENSCORE records the location of many of his collections. Chronologically arranged list of his specimens from various British herbaria. On his return he settled as a Fellow at Oxford before marrying and then taking a living as vicar of Twycross, Leicestershire. His natural history interests were very wide but he is perhaps best known as a botanist and mycologist - interests he may have acquired from his uncle, Thomas Purton. His botanical specimens are well distributed through British herbaria (although many are undated) and show his strong interest in Rubus and Rosa. In 1871 he retired to Harborough Magna, Warwickshire, where he remained as rector for the remainder of his life. 1801 September 22 : Birth Andrew was born at Rugby, Warwickshire, the fourth son, and sixth child, of the Rev. Richard Rouse Bloxam D.D.and his wife Ann (née Lawrence). He was not baptised until 1802 October 28 but it seems to be generally acceped that he was born in 1801. 1824 : Hawaii Between 1824 and 1825 Andrew Bloxam visited the Hawaiian Islands as naturalist aboard HMS Blonde. His diary of the expedition was published by the Bernice Pauahi Bishop Museum, Hawaii, as Special Publication 10 in 1923. The portrait shown on this page was provided for the publication by his grandson Henry Roby Bloxham, a resident of New Zealand. 1825 August 9 : "Mysterious Starling" On this day Andrew Bloxam collected birds on Mauke, Cook Islands. Among them was a specimen of the now extinct "Mysterious Starling" (Aplonis marvornata). Olsen S. L., 1986. An early account of some birds from Mauke, Cook Islands, and the origin of the "Mysterious Starling" Aplonis mavornata Buller. Notornis 33.4 197 - 208. MARRIAGES. On Tuesday last, at Congerstone, in this county, the Rev. Andrew Bloxam, M.A., Fellow of Worcester College, to Anne, daughter of the Rev. 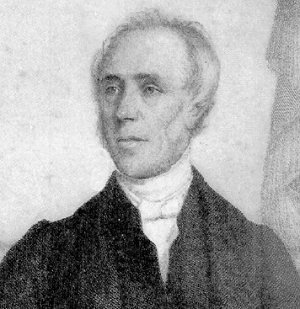 John Roby, rector of the former place. 1839 November 1 : Myriophyllum alterniflorum Specimens of this plant, found by Bloxam and new to the British flora, were exhibited at a meeting of the Botanical Society. He had first discovered the plant at Whixal Moss, Shropshire around 1836. "Earl Howe has presented the Rex. A. Bloxam, late fellow of Worcester College, to the perpetual curacy of Swycross (sic), Leicestershire. This much-esteemed nobleman has, we understand, given glebe land and a house, with a valuable endowment, to the Benifice." 1842 : Publication Potter, R. T. 1842. The History and Antiquities of Charnwood Forest. London. Appendix by Bloxam and Churchill Babington on the botany of the area. 1846 : Publication List of rarer plants found in the neighbourhood of Twycross, Leicestershire. The Phytologist p 640-642. A list of Rubi ibid. p675-6. "THE CHURCH. PREFERMENTS AND APPOINTMENTS. - ... Rev. A. Bloxam, rector of Harborough Magna, Warwickshire; ..."